A: The Chinese side strongly condemns the terrorist attack that happened in Barcelona, Spain,deeply mourns the victims and expresses sincere condolences to the injured and the bereaved families. President Xi Jinping and Premier Li Keqiang have sent a message of condolences to King Felipe VI of Spain and Spanish Prime Minister Mariano Rajoy Brey respectively. After the attack happened, China's Ministry of Foreign Affairs, the Chinese Embassy in Spain and the Chinese Consulate General in Barcelona have immediately launched the emergency mechanism, issued an security alert and closely followed the development of the situation. According to our information, by far, two Taiwanese compatriots were severely hurt and sent to hospital for urgent treatment. One Hong Kong compatriot was slightly injured and has been discharged from hospital. There is no other report of casualties of Chinese nationals. The Chinese Consulate General in Barcelona has sent officials to visit the Taiwanese compatriots who are treated for heavy injuries. The Ministry of Foreign Affairs and the Chinese Consulate General in Barcelona will continue to closely follow the evolution of the situation and offer necessary assistance to those injured. I would like to reiterate that China firmly opposes all forms of terrorism, steadfastly supports Spain in fighting terrorism and upholding national security and stability, and stands ready to reinforce counter-terrorist efforts with Spain and other members of the international community. Q: Reports from Indian media say that the Japanese Ambassador to India has expressed support to India's stance on the Doklam issue and said no one should change the status quo by force. Some reports also say that the US has called for direct talks between India and China to resolve it. What is your comment? A: I have noted the relevant reports. The Japanese Ambassador to India is probably eager to speak for India, but I would like to warn him anyway that it's better to make certain of facts before talking irresponsibly. I want to stress several points: first, there is no territorial n Dong Lang, as the delimited Sikkim section of the China-India boundary has been mutually recognized and observed by the two sides for 127 years. Second, it is India, rather than China, that illegally trespassed the boundary in an attempt to make provocations and change the status quo. Third, the Chinese side demands that the Indian side pull out all the illegally-crossing personnel and equipment, and this is the prerequisite and basis for the settlement of this incident and any meaningful dialogue. Q: It is reported that, on August 17, the High Court of Hong Kong reviewed the "Civic Square"case and sentenced Joshua Wong, Alex Chow and Nathan Law to six, seven and eight months in prison respectively. The opposition in Hong Kong and some Western media and politicians expressed dissatisfaction with the ruling and called it a "political crackdown". How do you respond to that? A: Hong Kong is a rule-of-law society and itsresidents are entitled to full rights, interests and freedom. However, no one shall engage in illegal and violent activities under the pretext of "democracy"or "freedom". The court of the Hong Kong Special Administration Region made the judgment of the relevant case on the basis of facts and in accordance with Hong Kong's law. I would like to reaffirm that Hong Kong is a Special Administration Region of China and Hong Kong's affairs belong to China's internal affairs. The Chinese side firmly opposes any external forces'interference in the affairs and judicial independence of the Hong Kong Special Administration Region. 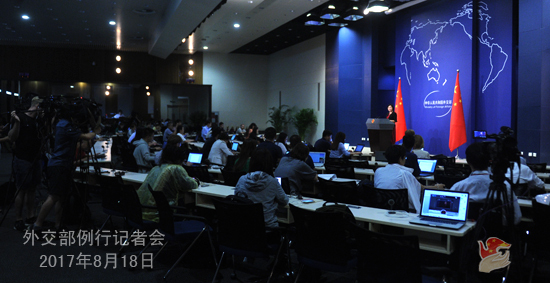 After the press conference, the following question was raised:Recently, a joint statement of the US-Japan Security Consultative Committee (SCC) was issued following the "2+2" meetingof the US and Japanese Foreign Ministers and Defense Ministers, which reaffirms that Article 5 of the US-Japan Treaty of Mutual Cooperation and Security applies to the Diaoyu Dao and expresses the so-called "serious concern"over the situation in the South China Sea. What's your response to that? 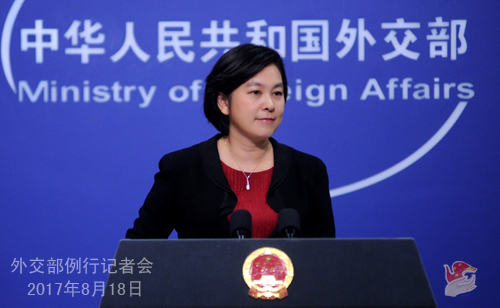 Hua Chunying said that, the Chinese side is gravely concerned about the above remarks of Japan and the US. 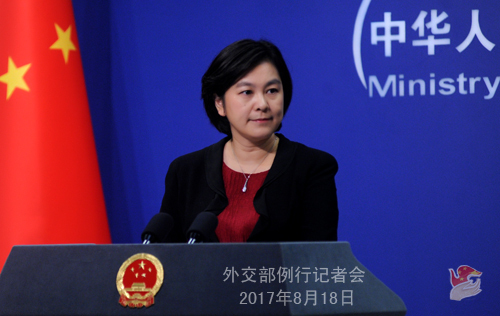 China's position on Diaoyu Dao and the South China Sea issue has been consistent and clear-cut. The Chinese government and people have firm resolve and determination to safeguard their own territorial sovereignty. The so-called the US-Japan Treaty of Mutual Cooperation and Security is a product of the Cold War and should not be used as a support for Japan's illegal claims or to undermine China's territorial sovereignty and other relevant interests. At present, the situation in the South China Sea has been stabilized and sound, with continuous positive progress in the relevant dialogue and consultation between China and ASEAN countries. As the US and Japan are not the directly concerned parties of the South China Sea issue, they ought to speak and act in a cautious manner and respect the efforts of regional countries to peacefully resolve the relevant disputes through consultation and negotiation, rather than the opposite. The Chinese side strongly urges the US and Japan to adopt a responsible attitude on the relevant issue, stop make erroneous remarks and do more things that are conducive to regional peace and stability.